Located in the center of Zagreb's business district, the International Hotel Zagreb caters especially to business travelers, but it is still within easy reach of many of the city's tourist attractions The hotel is within easy walking distance of Zagreb's old town, with all its interesting churches, monuments, and small shops. The International Hotel Zagreb is easily accessible by car, but guests can also get around Zagreb on foot or through the public transportation system. 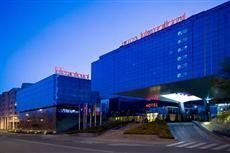 The rooms of the International Hotel Zagreb are all air conditioned and decorated in modern furnishings. The rooms include amenities like televisions with pay-per-view movies, Internet access, which is free, telephones, and minibars, which include tea and coffee making facilities. The rooms also include attached bathrooms where guests will find complimentary hair dryers. Guests of the International Hotel Zagreb can expect to take advantage of many modern amenities, including a large banquet area that can be used for business or personal purposes. Guests who need the area for presentations or meetings will be glad to know that it is equipped with up-to-date technology. The hotel also offers an on-site bar and restaurant and wireless Internet access throughout the public areas.